A deadly brain infection which kills up to 50 percent of people affected if it is left untreated. Meningococcal meningitis is a highly contagious bacterial form of meningitis – a serious inflammation of the meninges – the thin lining that surrounds the brain and spinal cord. In the last 20 years, according to the World Health Organisation (WHO), close to one million suspected cases of meningitis have been reported and 100,000 people have died. The vast majority of meningitis cases and deaths occur in Africa. During the dry season (December to June), epidemics regularly hit countries in the African ‘meningitis belt’, a region that stretches across the continent from Senegal to Ethiopia. Even when the disease is diagnosed early and adequate treatment is started, five to ten percent of patients do not survive, typically within 24 to 48 hours after the onset of symptoms. Left untreated, up to 50 percent of cases may die. Meningococcal meningitis is highly contagious. People infected with the bacterium Neisseria meningitis often carry the disease without showing symptoms and spread the bacteria through coughing and sneezing. Overcrowding and cramped living conditions increase the risk of spreading the disease. When infected people begin to show symptoms, they often experience sudden and intense headaches, fever, nausea, vomiting, photophobia (a low tolerance to light) and stiffness of the neck. Although anyone of any age can become infected with meningitis, babies and children are particularly susceptible. Diagnosing meningitis in the settings in which we work is often difficult as clinical examination is required - and quickly. A painful lumbar puncture is needed for the examination of spinal fluid and sometimes the bacteria can be seen under a microscope. However, the diagnosis is confirmed by growing bacteria from spinal fluid or blood. These diagnostic tests allow for further tests to see how effective certain antibiotics will be for the patient. A range of antibiotics can treat the infection, including penicillin, ampicillin, chloramphenicol and ceftriaxone. In areas with limited health infrastructure and resources, oily chloramphenicol or ceftriaxone are the drugs of choice because a single dose has been shown to be effective on meningococcal meningitis. However, timely mass vaccinations are the most effective means of limiting the spread of epidemics. The WHO has estimated that mass immunisations have managed to prevent up to 70 percent of expected cases in individual meningitis outbreaks in Africa. Meningococcal meningitis is a bacterial infection of the thin membranes surrounding the brain and spinal cord. It can cause sudden and intense headaches, fever, nausea, vomiting, sensitivity to light and stiffness of the neck. Death can follow within hours of the onset of symptoms. Even with treatment, approximately 10 per cent of people infected will die. Up to 50 per cent of people infected will die without treatment. Six strains of the bacterium Neisseria meningitidis (A, B, C, W135, X and Y) are known to cause meningitis. People can be carriers without showing symptoms and transmit the bacteria when they cough or sneeze. Cases are diagnosed through the examination of a sample of spinal fluid and treatment consists of specific antibiotics. Meningitis occurs throughout the world, but the majority of infections and deaths are in Africa, particularly across the ‘meningitis belt’, an east–west geographical strip from Ethiopia to Senegal, where prior to the introduction of a meningitis A conjugate vaccine in 2010, epidemics were most likely to be caused by meningococcus A. A vaccine against this strain provides protection for at least 10 years and prevents healthy carriers from transmitting the infection. Large preventive vaccination campaigns have been carried out in countries across the meningitis belt and stopped the cycle of deadly meningococcal A epidemics in the region, but smaller-scale outbreaks caused by other strains continue to be recorded. 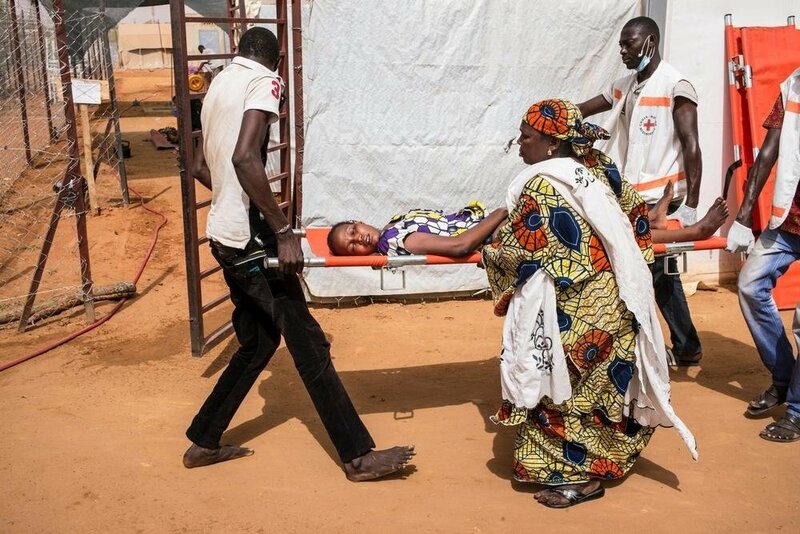 After the first large meningococcal C epidemic was recorded in Niger and Nigeria in 2015, most cases of meningitis C in 2016 were reported from Niger, without large-scale epidemics. In total, MSF vaccinated 169,200 people against meningitis in response to outbreaks in 2016.